GAINESVILLE, Ga. – December 18, 2009, was a day that changed the course of Bill Gibb’s life. While on his way to Atlanta from his home in Scaly Mountain, N.C., Gibbs decided to attend a free seminar Northeast Georgia Physicians Group (NGPG) Neurosurgeons were presenting about a new procedure offered at Northeast Georgia Medical Center called deep brain stimulation. Visit www.ngpg.org/neurosurgery to see before and after video footage! Deep brain stimulation (DBS) is a procedure that can control the symptoms of Parkinson’s disease, essential tremor and dystonia so a patient can regain control of his/her body. "I was diagnosed with Parkinson’s about four years ago," says Gibbs. "Ever since that diagnosis, I have been interested in learning all I could about treatment options." Gibbs says his desire for information was further fueled by the fact that his disease was progressing, to the point that he could no longer enjoy his favorite hobbies of fly fishing and golf, and even simple tasks, such as using a computer mouse, had become aggravating chores. "My shake was so bad that one time, I inadvertently sold a stock because I couldn’t get the mouse to the correct area of the screen," he says. "Parkinson’s is a debilitating disease. I knew the direction I was heading and was ready to try to do anything I could to get away from a disease like this." At the seminar, Gibbs learned that DBS involves implanting a thin wire, called a lead, into the brain. Once the best location for the lead is identified, an electrical current is sent through the wire until neurosurgeons find the frequency that best neutralizes the patient’s symptoms. After the surgery, the patient stays in the hospital overnight, then comes back two weeks later to have a controller placed for the stimulator. "The patients’ shaking or tremors are caused by their cells not firing at a normal rate," says Darlene Lobel, MD, a neurosurgeon with NGPG Neurosurgery who performs DBS at NGMC. "Deep brain stimulation works like a pacemaker for the brain. This device sends electrical impulses through the wire and into the brain, which makes the cells fire at a more regular rate and controls the tremor." Gibbs was so impressed with the seminar that he stayed after to talk to Dr. Lobel. Their conversation led Gibbs to make an appointment to see if he would be a candidate for the procedure. "There is a three to four week screening process that potential DBS patients must go through to qualify as a candidate," says Dr. Lobel. "Mr. Gibbs was cleared for surgery in March 2010 and was a very successful case." Since undergoing surgery in March, Gibbs has gained back a quality of life he will never again take for granted. 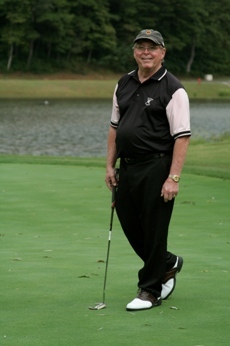 He is back to fly-fishing and has already won three golf tournaments since his surgery. "I have actually had people in disbelief that I have Parkinson’s because they cannot tell visually anymore," he says. "We recommend patients learn more about the procedure before they reach the late stages of their symptoms," says John Gorecki, MD, a neurosurgeon with NGPG Neurosurgery who also performs the DBS procedure at NGMC. "I ask patients to consider their quality of life since their diagnosis to determine if this is truly something they are ready to consider. In deciding if DBS is the right treatment option, it is good to know that DBS is completely reversible. So, if a better treatment for tremor is discovered in the future, we can still consider it as an option too." "For so long we had so little to offer patients with a tremor," says Dr. Lobel. "DBS can really change a patient’s life, and we see benefits immediately. It is an amazingly rewarding experience as a surgeon to be able to give someone their life back."